To the people who thought, "Why's the president spending time on a podcast?" 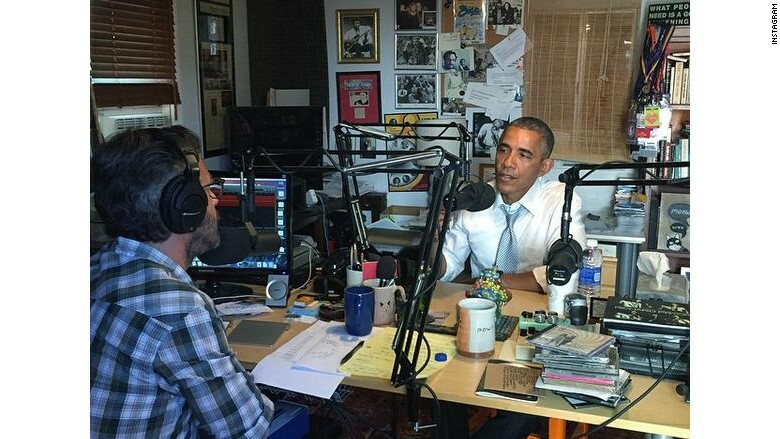 This may be the answer: Marc Maron's interview with President Obama has been downloaded more than 1.6 million times. Maron's producer Brendan McDonald said Sunday that it "is already our most downloaded episode overall after less than a week in publication." The presidential edition of "WTF with Marc Maron" was recorded on June 19 and released on June 22. It was accessed almost 750,000 times within 24 hours -- not just breaking "our record for most downloaded episode in a single day," McDonald said, but nearly quadrupling it. By the end of the workweek, it had been downloaded another 750,000 times. As of Sunday, the podcast is closing in on 1.7 million overall downloads. "The show is still generating a lot of downloads each day," McDonald said Sunday. "There were over 66,000 today, and Sunday is always our lowest traffic day." The podcast was recorded in the same place it always is: Maron's garage. Obama spoke with unusual candor about race relations, gun control, health care, and other topics. One of the big headlines out of the podcast was the president's use of the n-word to make a point about systemic racial bias. "He said the n-word to talk about using the n-word and what that implicates. It was a broader statement about racism," Maron said on "CBS This Morning: Saturday." Maron said the presidential interview had secretly been in the works for about a year. On the next edition of his podcast, to be released Monday, he interviews the film director Penelope Spheeris, and on Thursday, he interviews comedian Rich Vos.